If it has hooks for around the ears like now, no buy from me. Interferes with my glasses too much. If it is in-ear or canal headphones, with noise isolation, serious consideration. I'm likely a buy if it has the H1 chip and it's in-ear without the ear-hooks or other bulk. Currently use powerbeats 3 daily and love them. Great battery life. Obviously I would love a wireless version but my only negative would be I don't want to be that guy with headphones on constantly and sometimes like to just quickly remove them and drape them around my neck. I would definitely buy bc this is technology advancing. As long as they're as reliable as the Airpods (PB3's aren't exactly known for their stellar track record there) but add isolation while keeping all the good points of Airpods (eg H1, battery life, good mic, etc) then I'd give them serious consideration. But chances are good that I'll be disappointed and will end up with Airpods. would apple just release this as a website refresh? or is it possible they announce on Monday and ship in April? I’m not expecting any new HW on Monday. Exactly - the Powerbeats are great for cycling or other workouts where the ear hooks are almost mandatory. Spigen and a few other companies make neck straps for the AirPods. Somebody is likely to make something for these. With the limited battery durability of totally wireless headphones this category of product is effectively a subscription. Why not sell them as such? Every "ear speaker" I've tried falls out of my ears in less than 10 seconds, even if I'm stationary. Thanks for pointing out that the ear hooks interfere with glasses (I had been planning to get one, now I won't.) I guess my only option is "over the head" technology. My headphone dream would be for Apple to sell off the Beasts hardware division, and buy Klipsch. Develop some genuinely excellent (in audio terms) wireless earphones - a wireless version of their X20i at the top end and wireless x12i in the middle. Klipsch already do Wisa gear for home audio, so a wisa soundbar and optional surround wisa speakers to go with homepods for wireless audio from upcoming Wisa Tvs, without having to pay B&O prices. Meanwhile Master Dynamic MW07 are good. 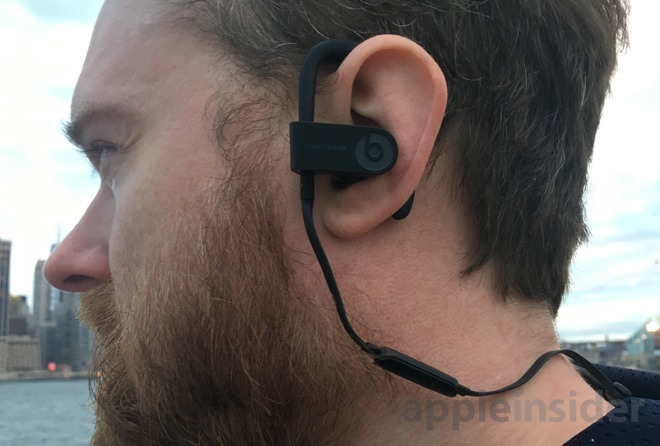 So, what do the Beats offer that AirPods don't? Is it more than just the color? Or the name? "just the color"? This is a wearable. What would you think if Apple Watch bands only came in white? "So, what do the Beats offer that AirPods don't? Is it more than just the color? Or the name?" It was a serious question dude. Are you trying to say that color is the only advantage Beats offers? Its the virtual coolness and its counter trend blackness. I hope Beats offer the soft silicon or foam in-ear buds - if it’s the hard plastic like the Apple product I sure won’t buy it. Hello JayBirds. I have and like AirPods very much, but might consider these new Beats depending on the execution and audio quality. I find the AirPods extremely convenient and comfortable. I can easily wear them longer than the batteries last. But they're a little light on a really good musical experience, and when out and about, traffic noise can easily overpower them. I can crank the AirPods up, but they still come in second, and that's not good for what's left of my hearing. I don't want to completely block out traffic sound, obviously, but some major attenuation would be appreciated. However I can't wear IECs nearly as long as the AirPods. Memory foam instead of silicone tips would help me in that respect. I bought a pair of the sports version of the PowerBeats 3. Mid workout as sweat gathered they would jump songs, pause videos, etc. Returned. Sports? I almost think my AirPods could handle sweat better. Maybe they have improved but I am not drawn to experiment again at that price. Costco took them back. Not sure I would be so lucky again.